Orange Sticky Buns...your New Halloween Tradition! We are now halfway through the first quarter of our school year and things are crazy -good crazy, but crazy! I&apos;m sure you are all about as busy as I am checking back packs, packing lunches, supervising homework, taxiing from activity to activity (soccer, swimming, football, violin) as well as all the other tasks we are all responsible for on a daily basis (laundry, dishes, blah-blah, blah-blah, blah). I know a lot of mornings my family relies on cold cereal, frozen waffles, or toast for breakfast, merely out of convenience, but there are some mornings that I want to serve my family a special breakfast treat even if I don&apos;t want to get up before the rooster crows to make it. Who wants to do that? Right? Which is why you are going to love this recipe for Orange Sticky Buns! It is one of those amazing recipes that you put together the night before, wake up, turn the oven on, grab a quick shower or help the kiddos get ready for school or finish up some last minute homework and it&apos;s ready to serve -almost like magic. It only takes about 20 - 30 minutes to bake, which I can totally handle if all I have to do is turn on the oven. The actual prep is really very simple too, so you don&apos;t even have to worry about staying up late to get them ready to go. Not only are they super easy, they are good enough that you can even use them for special occasions and holidays. The original recipe is my family&apos;s traditional Christmas morning breakfast treat and I&apos;m thinking these festive orange rolls just might turn into our new Halloween tradition. Sounds like a win-win to me! Are you ready to get started? First spray your favorite bundt pan with cooking spray, you can also use a tube pan (angel food cake pan). Place 18 Rhodes Frozen Dinner Rolls in the pan like so. Sprinkle them with half a package (1/4 cup if you are measuring) of Cook & Serve Butterscotch Pudding. Add a little finely grated orange zest. Next, melt a little brown sugar and butter together and bring to a boil. You&apos;ll want to forgo the microwave like I did in the above picture and actually make your caramel sauce in a saucepan on the stove top. You will get better results this way. Trust me, do as I say, not as I do!!! Over medium heat, melt your butter and brown sugar together until it comes to a rolling boil. The ingredients will combine together into a slightly thicker sauce that doesn&apos;t separate. it might even look a little foamy. Take the mixture off of the heat and add a little orange extract. Be careful because the hot mixture may sputter and spit. Stir until mixed well and pour over rolls. Cover loosely with foil that has been sprayed with cooking spray, and set aside to raise. I like to keep them safe and sound in the oven overnight. In the morning, or after the rolls and thawed and raised, bake at 325 degrees for 25-30 minutes or until golden brown. Immediately invert rolls onto a large serving platter and enjoy. Doubling this recipe works out great! One package of rolls contains enough for two batches so you won&apos;t have to worry about the other half of the pudding mix dusting your cupboards. I usually make one pan with nuts and one without. That way everyone is happy! My family always feels extra special when I make these for them! What is your family&apos;s favorite breakfast treat? Grease or spray a bundt pan with non-stick cooking spray. Sprinkle with nuts (optional). 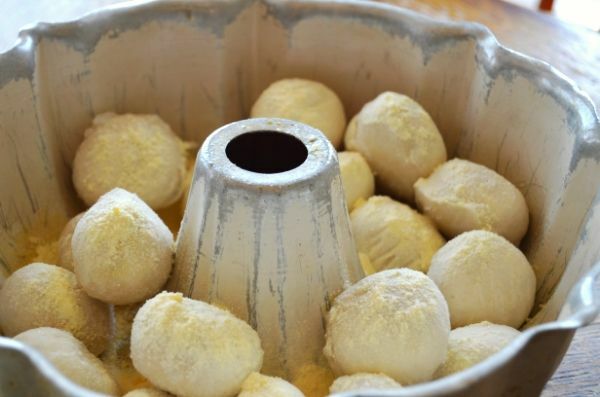 Place frozen rolls in pan. Sprinkle 1/4 cup of the butterscotch pudding over rolls. Make sure the pudding is NOT the instant kind! Sprinkle with finely grated orange zest. Melt butter and brown sugar together in a saucepan over medium heat. Bring to boil. Stir in orange extract and pour over rolls. Cover pan with greased foil. Place in a warm place overnight (the oven works great, as long as it is turned off). In the morning, bake at 325 degrees for ½ hour. Immediately invert rolls onto a large plate. Serve and enjoy! These rolls look delicious, and I like that they are easy to make.